One of the veggies we love is spinach, called Palak in Hindi. They are extremely good for health. 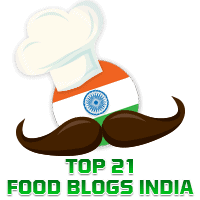 Elsewhere in this blog you will find recipes for other palak dishes such as Palak Paneer, and Dal Palak Lasooni . Likewise I often make dishes with mushrooms, such as Kadai Mushoom, and Mushroom Chettinad. I was delighted therefore to see this dish which is made with both spinach and mushrooms in Spice Up The Curry from where I have adapted the recipe for Palak Mushroom. Soak the cashewnuts in 2 tbsp of warm water for 10 minutes then grind them into a smooth paste. Keep aside. In a kadhai, heat 1 tbsp of oil. When it gets hot, add the onion, ginger, garlic and green chilli and saute on medium heat till the onion becomes translucent. Allow this mixture to cool, transfer to a mixer and grind it to a smooth puree. Keep aside. Then stir in the prepared spinach puree. Add water if needed to make a gravy consistency. Let it come to a boil. Now, add the prepared cashewnut paste, and mix well. Finally add garam masala and kasoori methi and mix well. Let it simmer for a couple of minutes. Serve the Palak Mushroom as a side dish with roti and nan, or with jeera rice.